In medium bowl, stir together milk, yogurt and chia seed until blended. Evenly divide mixture among 4 glasses. Spoon 1/4 cup cooled cooked quinoa on top of yogurt layer on each. Top each with a layer of fruit and almonds. Sprinkle with cinnamon. Let stand 5 minutes, or cover and refrigerate overnight. Breakfast. With Benefits. Start Happy. For all you beautiful babies out there, we have a special gift just for you. Yeah, you. Why? Because you deserve it. Our friend, Alejandro. is here to spice things up with an easy make-ahead breakfast that’s perfect for … the morning after. Watch as he tantalizes you with his smooth culinary skills like mixing delicious quinoa with the gentle creaminess of Yoplait yogurt, the perkiness of sweet, voluptuous berries, and a whisper of cinnamon. He’ll show you breakfast like you’ve never seen before and you’ll be left feeling satisfied and fantasizing about your next morning meal. So enjoy, and let Alejandro show you the “benefits” of starting your day happy. Ready to bring a little Alejandro into your kitchen? Here's how to make Berry Breakfast Quinoa. Gather your ingredients: Yoplait yogurt, milk, chia seeds, cooked quinoa, fresh berries, toasted almonds and cinnamon. Next, stir together yogurt, milk and some chia seeds. You may be familiar with chia from growing plant pets, but have you used it to boost your breakfast? 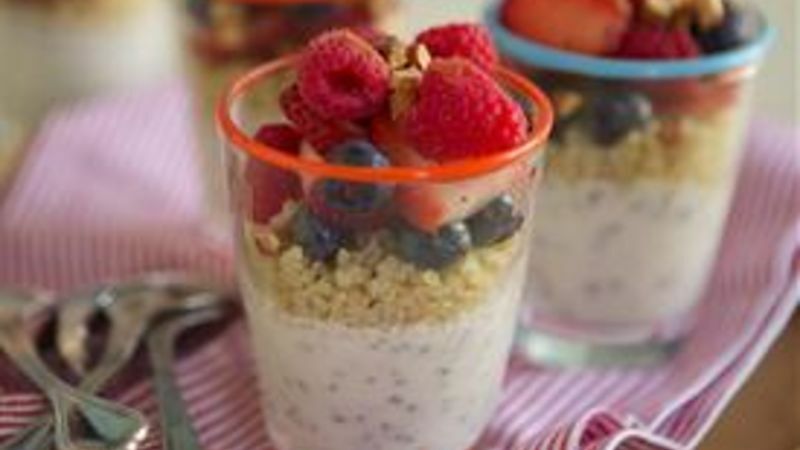 Chia seed makes a nice addition to these breakfast parfaits. It thickens the yogurt mixture and adds a nice crunch. Spoon the yogurt mixture into glasses, then add a layer of cooked quinoa. Top with mixed berries or other fresh fruit like peaches or mango. Sprinkle with toasted almonds and cinnamon to add flavor and crunch. Grab a spoon and dig in or pop in the fridge overnight for a ready-when-you-are breakfast.